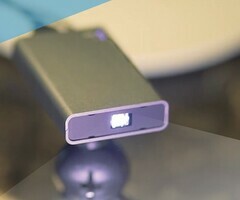 A start-up called Nebra has included its AnyBeam portable projector as a reward on its current Kickstarted campaign. It claims that, as this product uses lasers rather than bulbs, it avoids many of the drawbacks of other similar projectors. This new product comes either in a housing or as a Raspberry Pi-mountable module. Nebra claims that its AnyBeam portable projector solves a lot of the problems associated with this product category. For example, many of them rely on Digital Light Processing (DLP), which requires a flat, uniform surface for its content to be visible. Furthermore, the AnyBeam portable projector's light is provided by 30-ANSI lasers, which allows for a 'screen' from 5 inches to 150. This technology is packed into a housing measuring just 19.0x6.0x10.3 centimeters, which, Nebra claims, makes it the world's smallest portable projector. The AnyBeam reproduces content via its HDMI v1.4 port. Nebra claims that it is compatible with any applicable device (e.g. Chromecasts, Amazon Fire TV sticks, Kodi devices, etc.). It can also output audio with its 3.5mm jack. Alternatively, the projector comes in a HAT form, which is handy for anyone who would want to fit a projector to their Raspberry Pi. There is also a developer's kit, in which the AnyBeam is shipped in a bare-bones form ready to fit into a custom-designed housing. This projector appears to be a novel idea. On the other hand, Nebra says it is also fanless so as to reduce noise, but don't mention any other kind of heat management (apparently, its max temperature is 35 degrees Celsius). The projector may also need between 1 and 3 watts of power to operate; therefore, as it lacks an in-built battery to conserve its footprint, a user would need a power bank to support its DC input. Although Nebra claims that the 720P/60fps picture it throws is clear with inky blacks, even the samples shown in a promotional video can be said to look thin and washed-out. Those who like this concept in any case have the option to order a Nebra AnyBeam via its Kickstarter campaign. It is nearly £19,000 (or US$23,5904) through its £40,000 ($52,284) goal with 24 days to go.